Can I just ask please, on MJR's screenshot, what do the four lines of Japanese text with the % scores relate to? I can't find a translation. Last edited by CIT on Fri Apr 06, 2012 10:33 pm, edited 1 time in total. 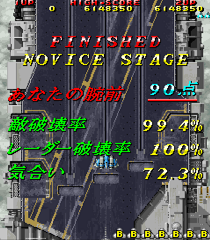 Plugged in my arcade PCB for the first time in a few months, managed to one life the training stage with a better score now. Tried this for the first time a while ago and found it a lot more fun that I had thought. Will play more. NMNB until the final boss, which I messed up completely. Got all the radars and all bomb pick ups as yellow. Could probably break 5M with a bit more effort but I think I'll look at the other courses instead. 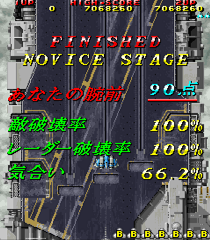 Nice job , I find the Novice course to be harder than expert for some reason. It's more a bit of trivia than something you'd want to go for in a score run. There's no spare life bonus for clearing Novice, and even if you learn how to get the extend without bombing, you're still sacrificing the medal or Miclus you'd get by blasting the box. Bumping this also reminded me to post my old scores for the other modes here too. I really need to get back to this game. Saucy's millions are better than my millions. saaadtooown. As soon as I get a new PSX console, this won't go unanswered! Quite a few enemies slipped through the cracks, but medal timing went pretty well. The major improvement came from the third boss, for which I finally learned the long 'n lucrative method after years of settling for the instakill. Seven million or bust! Nice job, I'm sure you'll reach 7 mil easily. Also, about the third boss, are you sure it's better to make the fight last longer than just finishing it off quickly? Does milking this boss yield more points than getting the timer-based bonus for killing it faster? Also, about the third boss, are you sure it's better to make the fight last longer than just finishing it off quickly? Does milking this boss yield more points than getting the timer-based bonus for killing it faster? Since the boss timer doesn't start until you blow the cover off, it's actually possible to keep it intact to the end of the canal while you time medals and kill things. Then when you're good and ready, you can remove the cover and get the 3-4 second boss kill. I mistimed some Micluses so I can definitely eke out a bit more. I think 7.2m will be a good point at which to cease spamming the thread. Edit: I uploaded a slightly lower-scoring run here. Last edited by saucykobold on Wed Jul 03, 2013 6:09 pm, edited 1 time in total. Sorry if this off topic again, but does anyone know what it says in the yellow subtitle on the title screen of the PSX version of Raiden DX? You mean this one? It just says "DX" in kana. Got back to this great game to fix some things with my Expert score. Death in 1-3 kind of ruined the score and I bombed several times in 1-8 because I'm a coward. I guess practicing 2-1 at least a bit would have helped too . I finally got back to this game after a while, and my skills are rusty, although I managed to improve my Novice and Expert scores somewhat. I am super happy though because I made it through with no deaths, but I bomb spammed against the 3rd and 5th bosses. I also missed the Stage 3 gold pyramid because I always confuse it with the spot of where it is on the Expert Course.